Raise awareness within the NYSAFLT membership and among policymakers about the reality of the teacher shortage in our state. Devise outreach efforts that better connect teacher education programs (supply lines) and positions in schools (demand). Establish initiatives that promote language teaching as a very viable career path. Support policymakers, school districts, schools and teachers in devising and implementing teacher retention initiatives/programs. Continue to build leaders through mentoring and collaborative opportunities. Encourage and highlight teacher leaders in our profession. Offer professional development that focuses on leadership in the profession. Encourage new teachers to present sessions at regional conferences, the Annual Conference, the Summer Institute and/or NECTFL. 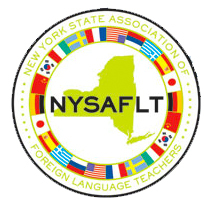 Ensure that the NYSAFLT website becomes the “go to” source for language education resources. Demystify the NYS Seal of Biliteracy process to make it more accessible to schools/teachers. Leverage parents as partners in promoting world language programming. Invite NYSAFLT members to add their stories of shortage and submit data about shortage. Advocate to policymakers in the state advocating for measures that we think will help mitigate the shortage issue. Engage current high school students, college students and preservice teachers in NYSAFLT programs. Partner with and highlight the teacher recruitment efforts of local, state and national organizations, schools and agencies. Transform the Leaders of Tomorrow program into one that is modeled after LILL. Offer opportunities outside of the Conference schedule for leaders and future leaders to network and build relationships. Provide a “How to Write a Successful Proposal” session at the Annual Conference or in a webinar, in order to encourage those who have never presented. Create collaborative opportunities at conferences for the Leaders of Tomorrow (or LILL) participants. Create an award for instructional leadership (not Wasley nor Cadoux) that promotes and encourages teachers to share their classroom experiences. Feature teacher leaders more prominently on the NYSAFLT website and in the NYSAFLT publications (newsletter for example). Emulate mentor-mentee programs in place both in NECTFL and ACTFL (new teachers can have a mentor at conferences as in NECTFL or have support for instruction as in the ACTFL program). Reorganize website to improve navigation, accessibility to resources, including an updated aesthetic. Create a special section of the NYSAFLT website just for parents with ideas for homeschooling, supplemental support, summer programs, etc. (i.e., Concordia Language Villages, Middlebury, etc.). Create a special section for advocacy (similar to JNCL-NCLIS CapWhiz). Add a section for students with language learning tips, study skills, contests and competitions, YouTube videos, etc.. Strengthen NYSAFLT branding via social media presence (i.e., Instagram, FB, YouTube, and Twitter). Create a ‘checklist’ or flowchart for implementation of Seal of Biliteracy. Provide interviews with recipients of the Seal of Biliteracy to illustrate benefits and with employers who seek biliterate employees. Offer Seal of Biliteracy StartUp session at NYSAFLT conference to help schools ‘get the ball rolling’. Provide parents with sample letters, templates, and roadmap for early language advocacy. Provide parents with case studies of successful advocacy projects. Offer suggestions for teachers to engage parents (ideas for parent helpers, events with parent participants). Roll-out the updated website with all language educators and administrators (not just members) throughout New York. Are you able to assist in fulfilling one of these goals? Please contact the NYSAFLT Strategic Planning Chair to share your ideas.